The Decembrist revolt or the Decembrist uprising (Russian: Восстание декабристов) was staged in Imperial Russia by army officers who led approximately three thousand Russian soldiers on December 26, 1825. Because these events occurred in December, the rebels were called the Decembrists (Dekabristy, Russian: Декабристы). 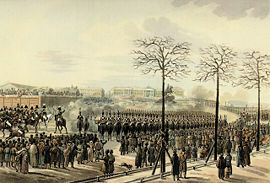 This uprising took place in the Senate Square in St. Petersburg. In 1925, to mark the centennial of the event, the square was renamed the Decembrist Square (Ploshchad' Dekabristov, Russian: Площадь Декабристов). The Decembrists were brutally repressed by the new Tsar, Nicholas I. Their leaders were executed or exiled. The Decembrists represented the elite of the military officers whose desire for greater freedom reflected the human desire for freedom and personal responsibility in governing their own affairs. Historians have generally agreed that a revolutionary movement was born during the reign of Alexander I. From the late seventeenth and early eighteenth centuries, the Russian nobility were increasingly exposed to European intellectual trends such as liberalism. During the period of rapprochement between Napoleon and Alexander, liberalism was encouraged on an official level, creating high expectations. The driving force for reform in Alexander’s regime was Mikhail Speransky. During his early years in the regime, Speransky helped inspire the organization of the Ministry of the Interior, the reform of ecclesiastic education, and the formulation of the government’s role in the country’s economic development. Speransky’s role increased greatly in 1808. From then until 1812, Speransky developed plans for the reorganization of Russia’s government. These plans held for a time the promise of a new constitutional regime. Speransky’s most noted essay pushed for a code of laws. Such a code of laws would have created a uniform legal system, and replaced the arbitrary decisions of government officials with objective procedures. This was the first step in the creation of a liberal style government. However, court intrigue slowly undermined Speransky’s influence with Alexander, and he was removed from the court. The officer corps of the Russian army, which vanquished Napoleon in 1812, was composed of young men of the aristocratic class. These young officers were the same men who, a couple of years earlier, could have been found exalting Napoleon in cocktail parties across Europe. Now, while occupying Western Europe, Russian officers were able to see Western society first hand. They attended classes at the liberal universities where they heard the same teachings that had inspired the Jacobins. They experienced the prosperity of nations where serfdom had been abolished, and where monarchical power was limited. They returned to Russia with strengthened liberal ideas, including human rights, representative government, and mass democracy. The intellectual Westernization that had been fostered in the eighteenth century by a paternalistic, autocratic Russian state now included opposition to autocracy, demands for representative government, calls for the abolition of serfdom, and, in some instances, advocacy of a revolutionary overthrow of the government. Officers were particularly furious that Alexander had granted Poland a constitution while Russia remained without one. Several secret organizations created projects to draft a Russian constitution, one project providing for a constitutional monarchy with another favoring a democratic republic. These societies were Masonic in style, and consisted primarily of military officers. The first of these societies formed was the Union of Salvation, established in St. Petersburg in 1816. A group of officers gathered together and formed this secret society of vague purpose. The later testimony of some Decembrists claimed the society was dedicated to the emancipation of serfs while others insisted its purpose was to expel foreign influences from Russia. Other testimony claimed that the objectives of the society, known only to the most senior members, were representative government and the refusal to take the oath of allegiance to the new sovereign unless he agreed to a limited monarchy. A founding member of the Union of Salvation, Nikita Muraviev, had been educated by an admirer of Robespierre. Muraviev was among the soldiers to enter Paris at the end of the war against Napoleon, and there he met many of the major political actors of the time. When internal politics and betrayal forced the dissolution of the society and the formation of the Northern and Southern Societies, Muraviev was chosen as the architect and leader of the Northern Society. Muraviev began the constitution by addressing the origin and nature of philosophy, providing an intellectual challenge to the tsar’s absolute right to rule. The Northern Society’s constitution was based on the theory of the social contract, arguing that the sovereignty of the state resides with the Russian people, and is relegated by them to the tsar. Muraviev expected implementation of this less radical constitution to meet with less resistance from the tsar and the other nobles than one that called for a representative government. Once the country had accepted the constitution, there would be time for further liberalization and movement towards a republic. Leading the Southern Society, Pavel Ivanovich Pestel wrote a far more radical constitution. Pestel desired the complete destruction of the Tsarist regime through revolution, and the introduction of a republic by a temporary dictatorship. Pestel designed his final plan to destroy any possible resumption of Romanov rule. The idea, based on that of Riego in Spain, called for a swift coup d'état to limit instability, and the elimination of the entire royal family. Following assumption of power, the Southern Society planned for the complete “Russification” of the empire. The republican government would recognize the autonomy of Poland, incorporate smaller nations on the borders, and require the conversion of all other peoples within, except for the Jews who would be deported to Asia Minor, where they were expected to establish an independent state. Among his more radical plans, Pestel’s agrarian reforms demonstrated familiarity with the French revolutionary literature. In his constitution, Pestel granted land to every Russian with a desire to farm. The two societies remained independent, and their leaders maintained philosophical differences all the way through the revolt. In the mid-1820s, the Northern Society in St. Petersburg and the Southern Society in Kishinev were preparing for an uprising when Alexander's unexpected death on December 1, 1825 spurred them to action. Alexander I died having left no direct heir to the throne. The populace expected that on the death of Alexander, his liberal-minded brother, Grand Duke Constantine Pavlovich, would ascend the throne in accordance with house law. Unbeknownst to the public, upon Constantine’s marriage to a non-royal Polish woman, Constantine had agreed to renounce his claim to the throne in favor of his autocratic younger brother Nicholas I. In 1822, Alexander had signed a declaration to the effect that Nicholas would take the throne upon his death. This document had only been seen by a few trusted members of the royal family. When Alexander died on December 1, 1825, the royal guards swore allegiance to Constantine. When Constantine made his renunciation public, and Nicholas stepped forward to assume the throne, the Northern Society acted. With the capital in temporary confusion, and one oath to Constantine having already been sworn, the society scrambled in secret meetings to convince regimental leaders not to swear allegiance to Nicholas. These efforts would culminate in the events of December 14. On the morning of December 14, 1825, a group of officers commanding about three thousand men assembled in Senate Square, where they refused to swear allegiance to the new tsar, Nicholas I, proclaiming instead their loyalty to the idea of a Russian constitution. They expected to be joined by the rest of the troops stationed in St. Petersburg, but they were disappointed. Nicholas spent the day gathering a military force, and then attacked with artillery. With the firing of the artillery came the end of the revolt in the north. On December 14 the leaders (many of whom belonged to the high aristocracy) elected Prince Sergei Petrovich Troubetzkoy as interim dictator and marched to the Senate Square. The subordinate soldiers had to follow suit. The revolt suffered because those in charge communicated poorly with the soldiers involved in the uprising. According to the story, soldiers in St. Petersburg were made to chant "Constantine and Constitution," but when questioned, many of them professed to believe that "Constitution" was Constantine's wife. However, this may just be a rumor because in a letter from Peter Kakhovsky to General Levashev, Kakhovsky wrote, "The story told to Your Excellency that, in the uprising of December 14 the rebels were shouting 'Long live the Constitution!' and that the people were asking 'What is Constitution, the wife of His Highness the Grand Duke?' is not true. It is an amusing invention." Kakhovsky claims that this is nothing but a story. When Prince Trubetskoy failed to turn up at the square, Nicholas sent Count Mikhail Miloradovich, a military hero who was greatly respected by ordinary soldiers, to pacify the rebels. While delivering a speech, Miloradovich was shot dead by the officer, Peter Kakhovsky. While the Northern Society scrambled in the days leading up to December 14, the Southern Society took a serious blow. On December 13, acting on reports of treason, the police arrested Pestel. It took two weeks for the Southern Society to learn of the events in the capital. Meanwhile, other members of the leadership were arrested. The Southern Society and a nationalistic group called the United Slavs discussed revolt. Upon learning the location of some of the arrested men, the United Slavs freed them by force. One of the freed men, Muraviev-Apostol, assumed leadership of the revolt. After converting the soldiers of Vasilkov to the cause, Muraviev-Apostol easily captured the city. The rebelling army was soon confronted by superior forces armed with artillery loaded with grapeshot, and with orders to destroy the rebels. 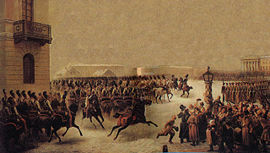 On January 3, the rebels met defeat and the surviving leaders were sent to St. Petersburg to stand trial with the Northern leaders. The Decembrists were interrogated, tried, and convicted. Kakhovsky was executed by hanging together with four other leading Decembrists: Pavel Pestel; the poet Kondraty Ryleyev; Sergey Muravyov-Apostol; and Mikhail Bestuzhev-Ryumin. Other Decembrists were exiled to Siberia, Kazakhstan, and the Far East. Suspicion also fell on several eminent persons who were on friendly terms with the Decembrist leaders and could have been aware of their concealed organizations, notably Alexander Pushkin, Alexander Griboyedov, and Aleksey Petrovich Yermolov. Wives of many Decembrists followed their husbands into exile. The expression Decembrist wife is a Russian symbol for the devotion of a wife to her husband. With the failure of the Decembrists, Russia's monarchial absolutism would continue for another century, although serfdom would be officially abolished in 1861. Though defeated, the Decembrists did effect some change on the regime. Their dissatisfaction forced Nicholas to turn his attention inward to address the issues of the empire. In 1826, a rehabilitated Speransky began the task of codifying Russian law, a task that continued throughout Nicholas’s reign. Anecdotally, after being defeated in the Crimean war, Nicholas is said to have lamented that his corrupt staff treated him worse than the Decembrists ever had. Although the revolt was a forbidden topic during Nicholas' reign, Alexander Herzen placed the profiles of executed Decembrists on the cover of his radical periodical Polar Star. Alexander Pushkin addressed poems to his Decembrist friends, Nikolai Nekrasov wrote a long poem about the Decembrist wives, and Leo Tolstoy started writing a novel on that liberal movement, which would later evolve into War and Peace. To some extent, the Decembrists were in the tradition of a long line of palace revolutionaries who wanted to place their candidate on the throne. But because the Decembrists also wanted to implement a liberal political program, their revolt has been considered the beginning of a revolutionary movement. The uprising was the first open breach between the government and liberal elements, and it would subsequently widen. This page was last modified on 8 November 2017, at 17:23.